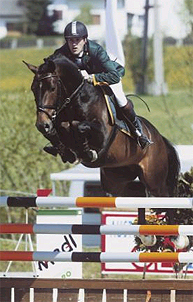 After a successful jumping career, Indoctro, Champion of the stallion test, has been used completely for breeding. And with success: at the age of 16 he received the title: ‘Preferent’. This is demonstrated in many champions, his daughter Wencke became provincial Champion and son Vancouver became reserve-Champion of the 4 years old jumpers in Holland. 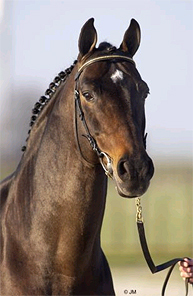 Olympia was Dutch Champion in 1999 and Orame was Champion of the Stallion Show in 1999. He already has many approved sons of which No Limit, Orame and Wittinger became Stallion Test Champions. In 2005 his son Ultimate became Dutch champion of the 4 year old jumpers, Rowan was Champion of the 7 and 8 year olds of the Eastern League final in USA and Richmond Hill was Reserve World Champion of the 7 Year old jumpers in Lanaken. 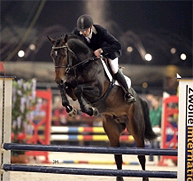 All over the world Grand Prix and World Cup’s were won by offspring of Indoctro. 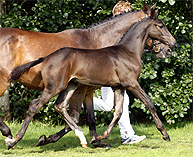 For example this year Casadora won the Grand Prix of Charlisle and Kentucky, Youp won the Grand Prix of Palm Beach and Tampa and the Derby of Calgary, Nassau won the Grand Prix of Gelderland and was earlier 3rd at the European Championships and 2nd at the Dutch Championships, Black Ice won the Grand Prix of Indio, Orame won the Grand Prix of Culpeper, Picolien Zeldenrust won the World Cup qualifier in Halton Place and Robin won the World Cup qualifier in Wroclaw, etc. Some other famous offspring are: Nike. 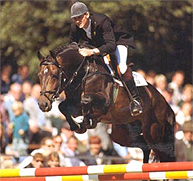 who reached the final of the Olympic Games in Athens, was 2nd in the Grand Prix of Valkenswaard and 3rd in the Grand Prix of Arezzo, VDL Maserati, who won the Derby of Valkenswaard, was 2nd in the Fidelity Grand Prix and 7th in the Derby of Hamburg, Nadia, who won the Challenge Cup of Wellington and was 6th in the Grand Prix of Las Vegas, Nobel, who won the Grand Prix of Compiegne. Further we see: Omona, Maddock, Meatloaf, No Limit, VDL Orestus, October, Oderike, VDL Montreal, Minka’s Diamond, Naf Naf, Owaola, Orchidee and Oscar, etc. In the USA Indoctro was honored as the USEF jump sire of the year. In Germany, Indoctro is 3rd on the German list of jump sires and he is the nr. 2 of the Holstein Studbook. Indoctro is truly a ‘Breeding Stallion’.